The musical direction was in the hands of Liceu’s former music director, Sebastian Weigle, who was more than competent as always, but who offered a uneven reading overall. He was fine in the first Act, while the wonderful Act II felt short of inspiration and rather anodyne although matters did improve for Act III. In general, I found this a perfectly correct and effective reading rather than a truly brilliant one, but it was also significantly better than the other Wagner operas in this theatre, conducted by Maestro Weigle in recent last years. Actually, the orchestra offered a much better performance than their average, as if they were fully aware of the importance of Wagner to this theatre. 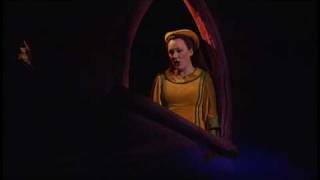 American soprano Deborah Voigt has been one of most outstanding sopranos since the 90s of course having become a Wagner voice of the first order and she still offers a compelling figure on stage, perfectly credible in a character as the Irish Princess. Her voice has changed a little and perhaps not entirely for the better. In the middle register the sound is still beautiful and well handled, albeit without some of the opulence from of a few years ago, but her upper range has lost some of its harmonics and today it is slightly tight and offers a less attractive sound. She was at her best in the “Liebestod”, sung with excellent taste and emotion and there is no doubt at all that she is still great artist, though not quite the exceptional soprano of some years ago.